The Hindu believes in the festivals of Lord Jagannath as the source of giving entertainment to the human society, So the festivals relating to Lord Jagannath are the occasions of great religious experience and devotional favour. In the metaphysical system the festivals are known as 'Yatra'. Many festivals of Puri are related to Lord Jagannath and the Jagannath temple , out of which one most important festival is 'Chandan Yatra'. This summer Festival of Lord Jagannath falls in April-May on Akshaya Trutiya i.e, the 3rd day of the bright fort night of the oriya month of Baisakha. This auspicious day also marks the beginning of the construction of the Rathas, chariots for the ceremonial sojourn of Jagannath,Balabhadra and Subhadra to the Gundicha Temple on the day of car festival. 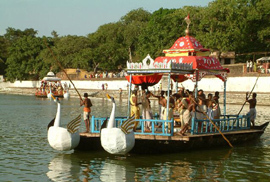 'Chandan Yatra', literally, Sandalwood paste festival, indicates the worshiping of the deities with sandal mixed water. Chandan yatra is devided into two periods i.e, Bahar chandan or outer chandan(21 days) and Bhitar chandan or inner chandan (21 days). The outer chandan lasts for 21 days. Everyday the representative images of the deities i.e, Rama, Krishna, Madan Mohan, Laxmi and Saraswati(Biswadhatri) are taken in a procession to the famous Narendra tank or chandan pokhari. The five shivas known as Pancha Pandavas, namely Lokanath, Yameswar, Markandaya, Kapal Mochan and Nilakantha, accompany Madan Mohan(the representative of Lord Jagannath) to the narendra tank. In a gorgeously decorated boat Madan Mohan, Laxmi and Saraswati are placed and in another are placed Rama, Krishna and the Pancha Pandavas(five shivas). The deities enjoy an evening cruise and various models of worship in the pictureseque narendra tank with the accompaniment of music and dance. On the last day of the festival 'Bhaunri Yatra' is performed. The procession start up from Singhadwara to Narendra puskarini amid Hymn, bhajan, kirtana, mridanga, ghanta etc. wich site a pictureseque panaroma worth seeing. The traditionaly decorated royal elephant takes the lead followed by two gigantic decorated palinquies or vimana carrying the deities to their destination. The sacred vimanas takes rest on the shoulders of the professionally earmarked viman badus.Throughout their journey thousands of devotees throng to cover the glimpse of the yatra,offering puja & pankti bhoga to the deities. All along the way to narendra tank the conventional huge wooden sheds or chamundiya were erected enabling rest for the deities. Besides these, devotees carry chatris or the umbrellas made by the skilled pipili people projecting there of the rich art and craft of the city. Thousand of people are seen taking a dip in this holy tank considering to be auspicious in this part of the year. After the completion of the outer chandan yatra,the inner chandan yatra starts inside the temple and lasts for 21 days.Various rites are performed inside the temple, out of view of the public. Narendra tank is built by Narendra Dev, son of Kapilendra Dev. Being shouldered the responsibility of the kingdom in the hand of Purrosottam, Narendra devoted his time and energy and spent a lot to the all round development of this holy tank. Situated about three quarters of a mile north-east of the Jagannath temple,the Narendra tank covers an area of over 3.240 hectares(8 acres). It is 834 feet by 873 feet in size. 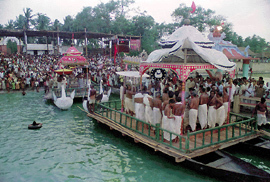 The tank has an island in its middle bearing a small temple, connected with the south bank with a bridge, to which Madan Mohan, the representative deity of Jagannath, is brought during the chandan yatra. According to the opinion of Puri people this chandan yatra was contemplated perhaps to impact training to our youngmen in the field of sea-voyage. In this support the history says that the people of Orissa had maritime commerce with several countries in the Eastern region. So now-a-days many young men swim in narendra sarovar in this regard.